As I power wash a dead spider and her eggs out from under the lip of a bucket, I silently apologize that they aren’t invited on our trip. In two months, a team of six, including myself, is headed to Kure Atoll. I can’t even say the words without a sense of awe. Kure is the northern most coral atoll in the world and the most remote of the Northwestern Hawaiian Islands. It is located 28 degrees north of the equator and 100 miles east of the International Date Line. Kure is a stopping ground for hundreds of thousands of nesting seabirds and breeding grounds for the endangered Hawaiian Monk Seal. Soon, it’ll be my home. In my free time, I keep google-imaging pictures of Kure. It looks like a textbook definition of an atoll with an almost perfect circle of coral reef encircling a lagoon and an island. The island has strict quarantine measures, a testament to the work being conducted there. Invasive species removal is a current priority, which means stragglers in the form of seeds, eggs, insects and lizards are unwelcome. 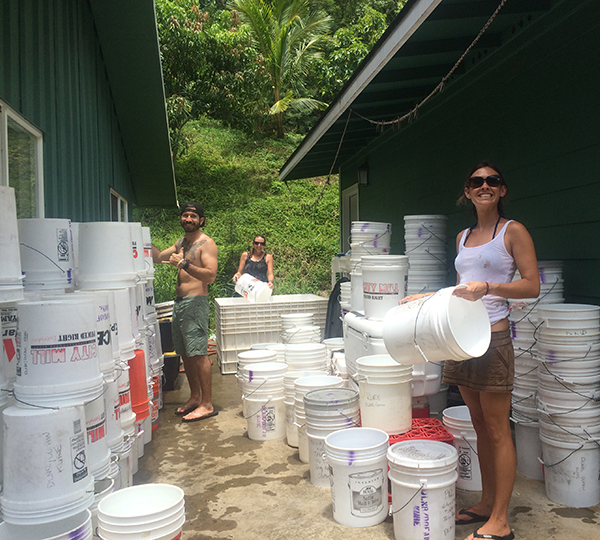 Today, that also means we’re power washing a couple hundred buckets that will serve as our suitcases. Aside from evicting any unwanted guests, I’m also using Goo Gone to wipe off notes describing what the buckets held for previous field teams – including food provisions. To be honest, I assumed we would be eating rice and beans for three meals a day for six months. I’m pleasantly surprised to read labels describing a wide variety of food items including some luxuries like popcorn and chocolate chips. If I was already excited about the winter field season on Kure, I’m even more excited after a day of preparations. Of course, finding out that I can eat a chocolate chip cookie after a hard day in the field is even more of a reason to celebrate.